There is a way in which we speak about teenage pregnancy in Australia – it is treated as a dead-end, as a ‘bad decision’, as a sealed fate. The fact is though, that although having a kid as a teenager may not be many girls’ first choice, it doesn’t have to be a total disaster – if there were programs in place to help girls finish their education, find jobs and foster careers without having to stick to a rigid school structure, no opportunities would have to be lost. That’s why the Dale Young Mothers’ Program in Wyong, NSW is so inspiring to me. Funded by the Youth Connections program and the Wyong Better Futures Local Solutions Local Advisory Group, the program gives young parents the chance to complete their year 12 certificate and form pathways to further education/work by creating a supportive environment that is flexible and that caters to the needs of both the parents and their children. Lip spoke to four of the young mothers completing the program about their experiences, and what their future looks like now. We’ll be bringing you their stories over the next few weeks. First, meet Skye, a 19-year-old mother of two who fell pregnant with her first child at 16. 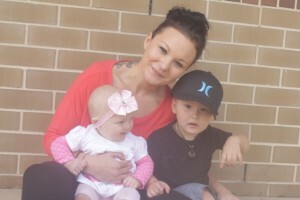 Skye’s resilience and tenacity is inspiring, and the Young Mothers’ Program has helped her carve out plans for the future, and for the future of her son, Mason, and daughter, Scarlette. Lip : Can you tell us a bit about your story so far? Skye: I fell pregnant with Mason when I was 16 and had him at 17. I was kicked out of home when I was 16. It’s been tough, because most of the time I’ve been on my own. When Mason was born he was born with nystagmus, which means his eyes move. It was scary at first, because I was alone. They are still doing tests on Mason to find out more about his condition, so that’s pretty tough. People notice, people ask, people look. He is different, but I think it’s okay. Aaron, the father of my second child Scarlette, is my current partner and he’s a lovely man. He looks after Mason and treats Mason as if he’s his own. He supports all of us including Mason; he pays for appointments and comes along for support. I guess when I was younger and on my own I was very lonely. It was very hard and I was very lost. I knew that I had to look after Mason so my main priority was our lives. I wasn’t looking at education at that point because I felt I had no options. I didn’t see education as an option at all for me at the time. When Mason was a bit older I met Aaron. He encouraged me to get my license, so I did. I’ve always wanted to go to uni, but have always had people telling me that I had wasted my life, given up my life. So for a long time I thought I was in the YPP to prove to them all wrong. But after a year and a half in the program, I feel like they don’t deserve to see me succeed. I’m doing it all on my own and I’m doing it for my kids. Not to prove everyone wrong. Which was a big thing and everyone here (at YPP) helped me to understand that as well. L: Tell us a bit about Mason and Scarlette – what are their habits and personalities? S: Well, Scarlette is six months and she is the smiliest baby you will ever meet. She always smiles from the time she opens her eyes to when she closes them. She is trying so hard to crawl, it’s so funny – she gets up on all fours and rocks back and forth. She’s a little bit too young to do some things yet. Mason has just turned two. He loves cars! He loves the movie Cars, his favourite character is McQueen so I bought him lots of McQueen things. We like to go to car shows and monster truck shows and that’s my favourite thing to do with him. Mason is just Mason. He’s very cool, he’s a cool kid. He’s not violent toward anyone, like everyone told me he would be; they said ‘you’ll need to be careful of the new baby (Scarlette) because jealousy comes into it.’ He yells out ‘sissy!’ ‘sissy!’ and kisses her ‘mwah’ ‘mwah’! He just loves everyone. I love him for that…So he is just a real cute loving kid! L: How do you think the Young Mothers’ Program has helped you? S: Apart from education wise, the YMP has helped me deal with situations. For example Mason picked up on a few swear words and I had people comment on it and I didn’t know what to do. I didn’t know how to handle it, I researched it and nothing was working. The YMP teachers suggested a few options and they worked. So they helped me deal with those sorts of situations and other situations like I’ve never had problems putting my kids in routines, and they’ve helped me keep going with it. They’ve also really encouraged me to teach other people in here too, because you can see a child who hasn’t had enough sleep, you can really see the difference. So they’ve encouraged me to support other people, which I didn’t think I was in any position to do until I came here. Now I do support other people, especially the younger mums that come in here that are 16/17 because I was in their shoes. So I can say, well it’s really hard while you’re there but once you get passed a certain point your only option is to move forward. L: Did you have a different view of your future before you started the YMP? S: Not really. I always knew where I wanted to go. I was going to Wyong TAFE to do my HSC, but it was really difficult for me because I don’t like putting my kids in childcare, so when I heard of this program I was like, ‘oh, cool, I can come here and literally walk three meters up the hallway open the curtain and see my kids!’. That’s why I left Wyong TAFE to come here. L: What are your plans after the program? What would you like to do in the future? S: I want to go to uni. I’m a little bit undecided though, because some friends of mine have said that they don’t like it because they are half at home and half at uni all the time and that will be hard for me because I’m all about my kids. I want to be a midwife, because when I was pregnant with Mason, because I was so young, I had a lot of prejudice against me. With Mason, I was in the hospital four weeks before I gave birth and they were horrible to me. They made me cry every single night. I was in intense pain and I remember my sister called me after a week and a half and I balled my eyes out to her. She said ‘Oh my god, what’s going on?’. My sister was very supportive during the pregnancy. Because I wasn’t with Mason’s dad, my sister would come along to my appointments. I just thought, why make an excuse for it? Why just be nasty to me? Pretty much after that point I said to myself, ‘I’m going to be a midwife, and I’m going to treat all people with the same respect and equality’. Some people don’t cope with being pregnant at a very young age. I suffered very bad depression, but nobody looked at that side of it, nobody thought ‘I wonder what she’s going through, I wonder how this happened’. That’s why I want to be a midwife. L: If you could offer any advice to a young parent, what would it be? S: Don’t listen to anyone at all. There is a fine line between someone telling you what to do and offering you advice. Taking advice is absolutely fine, but the right advice. If people didn’t give me advice when I was 17, God knows where I would have ended up. People told me to abort Mason and told me I would never finish my HSC. People told me that I would never go to uni, but because I am so strong minded I didn’t listen to those negative comments. That’s why I am here today. I have a beautiful two year old baby boy and six month old girl and I will finish my HSC in October this year and next year I plan to go to uni. That’s all because of me. I didn’t get any positive comments from anyone and had nobody saying ‘You can do it, keep going.’ People told me I ruined my life. Now I can say, ‘look where I am now’. That would be my advice. Stick with it. It is tough, it is hard. There are times when I cry, there’s times when I’m angry, but every day is a new day and I think if you do the things you want to do even though it’s hard, and it is bloody hard, when you accomplish it, you’re happy. Because you’ve done it. If I listened to those people, I guess I wouldn’t be anywhere. You can find out more about Youth Connections through their website. The Wyong Local Advisory Group funds the Young Parents Program Wyong and also supports the local community. The Local Advisory Group aim to increase employment opportunities, improve social economic and social participation, promote accessibility to early childhood support, increase levels of educational attainment and promote the development of life skills of young parents, jobless families and the long-term unemployed in the Wyong Local Government Area (LGA). Fantastic project and fantastic story …great to see that there’s community support for these chicks and that community organisations have pulled in to help. Good one! The Young Parents Program is a wonderful initiative made possible by funding provided by the Wyong Better Futures Local Solutions Local Advisory Group and the Youth Connections program. The young women enrolled in this program have the amazing support of the DALE school teachers, creche staff and YC program support workers. It’s so inspiring to see these young women flourish, their dreams held strongly in their hearts, and their careers only a step away. Congratulations to all the beautiful young who are all working step by step to pave the way for a secure future for themselves, and their children. This entry was posted in Featured, Life and tagged education, opportunities, teenage pregnancy, young parents program. Bookmark the permalink.